Volume-Weighted Average Price [VWAP] is a dynamic, weighted average designed to more accurately reflect a security’s true average price over a given period. Mathematically, VWAP is the summation of money (i.e., Volume x Price) transacted divided by the total volume over any time horizon, typically from market open to market close. Here’s an easy way to remember it: when you take a dollar-cost-average of several trades (that make up a total position), you’re basically taking the VWAP — the ‘money-weighted’ average — of a finite number of (your) trades. 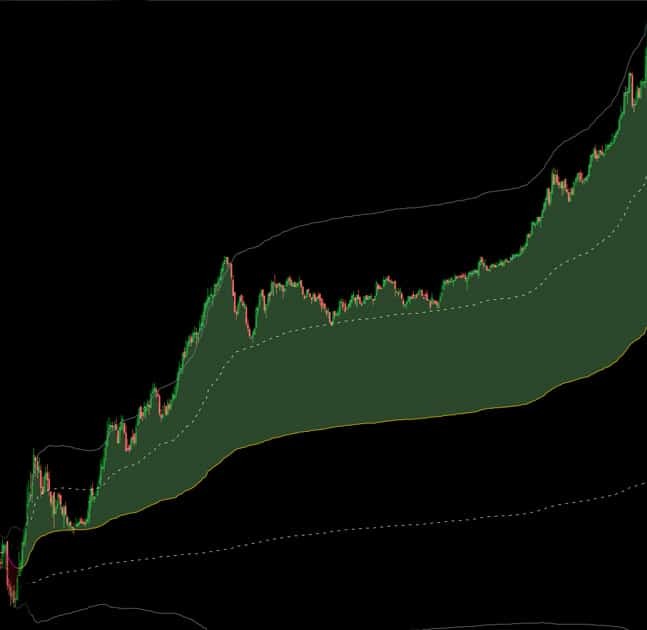 A given VWAP is essentially the dollar-cost-average of all traders’ transactions for that security across the entire day. By putting more emphasis on higher volume candles (relative to the day’s total), the VWAP moves more during periods of greater participation and therefore, greater importance. Simply put, it ‘speeds up’ during high volume and ‘slows down’ for low volume — a dynamic way of accounting for the obvious truth that more money traded means more market impact. VWAP reflects the capitalist democracy of the market — where it’s one vote per share, not one vote per trader — more honestly describing the concept all traders implicitly accept: that the market is driven by large participants. Institutions use it to objectively evaluate the execution quality of large trades, whereas independent traders experience this as dynamic, otherwise hidden support and resistance occurring at the VWAP (or associated standard deviation bands). VWAP is widespread throughout the institutional trading community, logical and intuitive in its construction, and requires almost no user input. 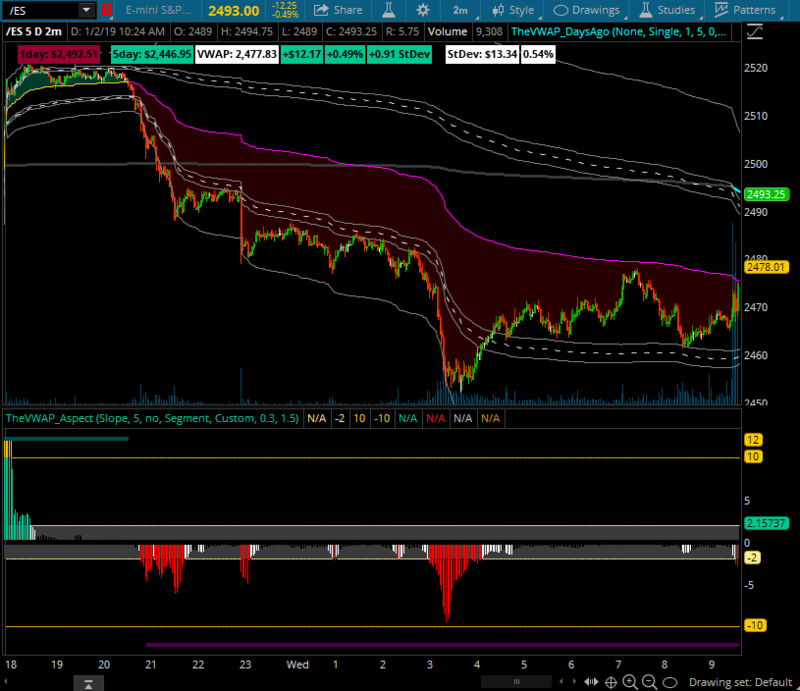 The use of VWAP and its associated standard deviation bands illuminate areas of support and resistance that otherwise go unseen. Even in its simplest form, incorporating VWAP into your trading can further your ability to understand and analyze the markets. VWAP is a holistic, dynamic benchmark universally understood and applied by institutions, and is the most common benchmark used to determine transaction costs (and therefore, to judge institutional traders’ efficiency when executing a trade). Institutional traders are — on a very fast and sophisticated level — tasked with achieving the most favorable dollar-cost average of their positions. By contrasting trade execution (NOT the outcome of the trade, just the entry price) with the security’s true average price (VWAP), an institution can objectively gauge their traders’ performance. But it’s not enough to merely know if an entry is above or below the benchmark — we need a consistent measurement of distance to the VWAP. Standard deviation bands are the most logical metric for this task — we can’t use dollar-distance (because some stocks are huge, and some are small), we can’t use percent-distance (because some stocks typically move significantly, and others rarely do). Standard deviations are a statistically valid method of gauging distance from the mean of a dataset, which in this case is price’s distance from VWAP. Odds are, you’re asking yourself a cumulative question — “What’s the average price of this stock for the day?” — without respect to any silly, arbitrary number of bars. That’s because the human brain thinks in terms of cumulative questions (such as “How have you been since we last saw each other?”, not “How have you been for the last 20/50/200 hours?”). Nearly every other indicator is periodic (looking back at a fixed number of bars), despite the intuitive nature of something cumulative like VWAP. This chart depicts the significance each type of average applies to various bars within their calculations. SMAs treat every bar as uniformly-weighted, EMAs treat more recent bars with a heavier weight, and VWAPs are dynamic — comparing the current bar’s volume to the total volume for the day. Almost all indicators require idiosyncratic adjustment to each chart, and then to each timeframe. Some indicators work brilliantly on one chart but are completely useless on the next until calibrated, but not VWAP — there’s one choice (and therefore no chance for traders to screw it up!) and frankly, that’s a good thing. 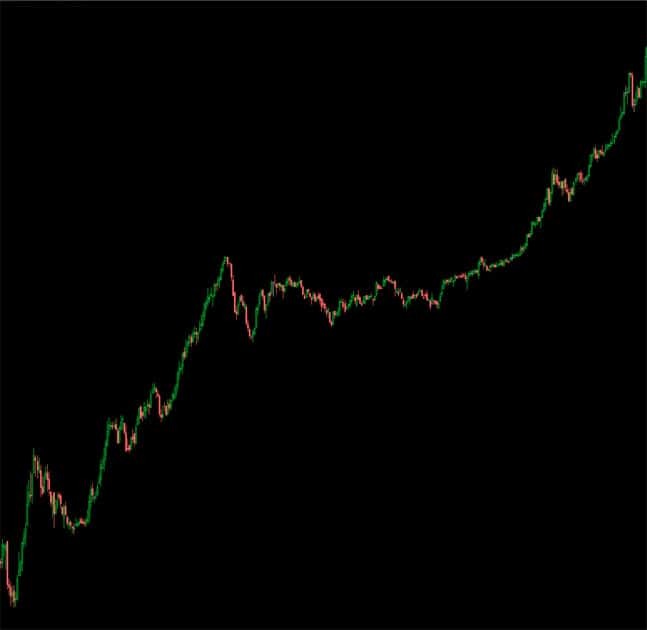 There’s no 9-bar exponential VWAP. There’s no 21-bar simple VWAP. The VWAP is THE VWAP and therefore you won’t be watching an incorrect version — because there’s only ONE true intraday average price. Put your email in below and I’ll send you a copy when it’s out!